This exchange illustrates the situation in Srinagar, devastated by the recent floods. I was closely monitoring the situation from day one (September 7), through the media and friends in Kashmir. The feedback was passed to various Central authorities, especially the NDRF. Unfortunately, the state administration seemed to be comatose. The army, air force, NDRF and paramilitary forces did a splendid job, despite the odds. Civilians too helped each other. Most shrines were open to all, irrespective of religion. 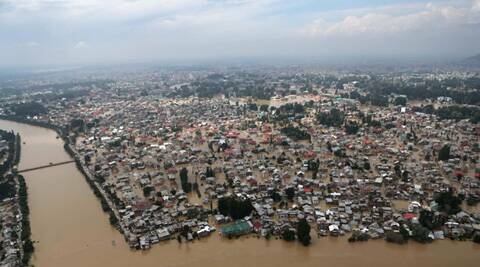 As I could bear the tragedy no longer, I decided to visit Srinagar for firsthand information and a correct appraisal of the situation, so that requisite assistance could be arranged. I was shocked to see the situation on the ground. Only the gurdwara’s rescue teams and a few civilians could be seen struggling to rescue trapped victims and extricate bodies. The victims were cursing the state government and praising the young Sikh boys who were toiling untiringly to help others. A minuscule minority (about a half per cent of the total population of the Valley) took to the steering wheel to protect all those in need, cutting across the barriers of religion! Shattered by my encounters, I went to the main gurdwara, where thousands had taken refuge. The holy Guru Granth Sahib had been shifted from the sanctum sanctorum to a smaller room to accommodate those who had trusted the Sikhs for shelter. For, as Sikh philosophy professes, “Service to mankind is service to God.” The SGPC organised langar. Local Sikhs set up a medical camp. A few doctors had arrived from Amritsar, too. Blankets, clothes, medicines, rice, etc were distributed. I felt a little better seeing all this. The system was functioning reasonably well. I only helped the gurdwara management streamline various tasks with a well-assigned chain of command and unambiguous responsibilities. A control room was set up to disseminate information and address problems. I was benumbed by a Sikh senior citizen narrating how his family had suffered during Partition and how they had struggled to earn their livelihood. Once again, they were back to what they had suffered 67 years ago. He added that it was not the financial loss that pained him, but the fact that he had to spread his hands for rice and blankets. He was not able to reconcile himself to this incalculable humiliation (“zillat”, in his words). We shall encounter many such instances of fractured self-esteem, psychological disorders, depression and even suicidal tendencies. These have to be dealt with the sensitivity they deserve. Experts should be roped in for counselling. I foresee numerous challenges immediately after the victims return to their destroyed, damaged or vulnerable homes. The winter will also set in towards the end of October. Besides organising funds and transit accommodation, victims will have to run from pillar to post for duplicates of vital documents, such as PAN cards, voter identity cards, property documents, etc, which will be necessary for obtaining loans and jobs. Another major challenge will be the rehabilitation of the Sikh community, no more than 65,000 in number and spread all over the Valley, with around 20,000 living in Srinagar. Most are either poor or belong to the lower middle class. They have suffered immensely in these floods. Since many of them were displaced after Partition, they are in a dilemma whether to stay on in the Valley or move elsewhere. If they left, it would further erode the diversity of the Valley. The Sikh community of Kashmir defines itself as a distinct ethnic group. A tiny minority, it has integrated itself in Kashmiri society. In many ways, these Sikhs have imbibed the local culture. After the exodus of Kashmiri Pandits, it is only the Sikh community that has provided diversity to Kashmir, despite suffering the tragedies of the Chattisinghpora and Mehjoor Nagar massacres. Their decision to stay back thereafter was appreciated by everyone. They have enjoyed the goodwill of the majority. Unfortunately, these Sikhs have not been recognised as a minority, in spite of repeated memoranda sent to the state and Central governments. Because of this, there are no reservations in government jobs or educational institutions for them. The community perceives this as discrimination, since their Pandit brothers enjoy such concessions at the national level, despite the fact that they have left the Valley. It is, therefore, sad that, with no secure jobs and a bleak future, Kashmir’s Sikhs are feeling helpless. There is an urgent need to rehabilitate all homeless Sikhs in the Valley and compensate them judiciously, to save them from the coming winter. The task of rehabilitation will be arduous. Besides despatching immediate requirements such as food, clothes, blankets and medicines, measures have to be taken to ensure jobs with dignity for all our Kashmiri brethren. Kashmiri art is well known the world over, so why not set up a cottage industry to promote local talent? The Valley has witnessed an unprecedented spur in tourism over the last three years. Business houses can harness this potential and plough funds into the Valley. And, as a social commitment, they can sponsor rehabilitation programmes and build housing colonies. Natural disasters are a universal reality. But the level of preparedness and speed of response decide how much a country values its human lives. Sadly, we do not have an efficient system in place. Last year alone, almost 5,700 lives were lost after a cloudburst caused floods in Uttarakhand. We have been given many wake-up calls, but we continue to slumber. If we show solidarity, the Valley will soon be back on its wheels. But are we going to learn our lesson? Will the administration be proactive and take the requisite steps — such as a flood alarm system, orderly urban development and proper land use — to prevent such major disasters in future? The onus is entirely on us when it comes to what we wish for our future generations. If we fail today, posterity will never pardon us.